Off the shore of Brazil, the Mutanimals wave goodbye to the Turtles, Splinter and Ninjara as they sail away on a lifeboat outfitted with a solar paddle of Don’s design. Nearing the Caribbean’s, a fierce storm overtakes the vessel, washing everyone ashore. The next morning, everyone comes to and they are greeted by the indigenous natives; the Arawakans. Though they can’t understand each other, the Arawakans are peaceful and welcome the Turtles. Splinter is confused, as he thought there were no indigenous tribes left in the Caribbean’s. Suddenly, off the horizon approach three Spanish caravels which a bewildered Dontallo identifies as the Nina, the Pinta and the Santa Maria! A boatful of Spanish Conquistadors arrive on shore, led by none other than Christopher Columbus, and they quickly surround the Natives and the Turtles. The Spanish take no notice of the Turtles, treating them as if they were just like the natives. Declaring his trade route discovery a success, Columbus leaves a detachment of Conquistadors behind to guard the natives and has Donatello taken hostage back to his ship, to be brought back to Spain as proof of his expedition’s success. 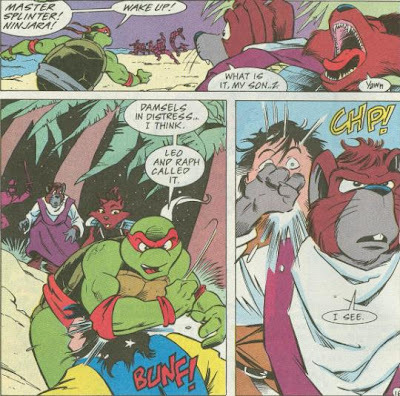 Raphael is about to stop the Conquistadors when Splinter orders him to stand down and let the events play out. That night, inside the brig, Don is greeted by Columbus (speaking Italian, which Don can’t understand). Columbus explains the value of gold and that both Don and the Arawakans represent a tremendous fortune for himself and all of Spain. Back on shore, Mike is frustrated because he’s starving for a pizza while Raph is frustrated with Splinter’s orders. Leo tells him that they must obey their master and sit still. A woman screams and they then notice several Conquistadors trying to drag an Arawakan girl away. The Turtles interfere, inciting a battle with the Conquistadors. Splinter and Ninjara enter the fray and quell the Spanish. 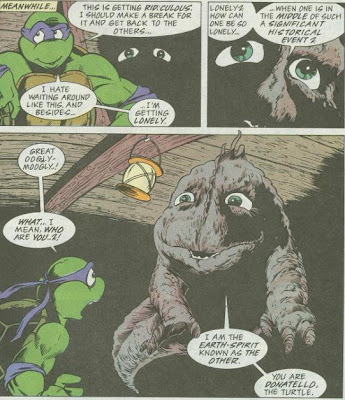 Leo apologizes to Splinter, but Splinter tells him there’s no need and that now the time is right to go rescue Donatello. As they swim out toward the ships, the natives interpret it as the animal-men returning to the sea. In the brig, Don is met by a strange tadpole-like creature, an Earth-Spirit known only as the Other. The Other explains to Don that the place where Columbus made landfall in the Caribbean’s is a point of great supernatural power in the Earth. 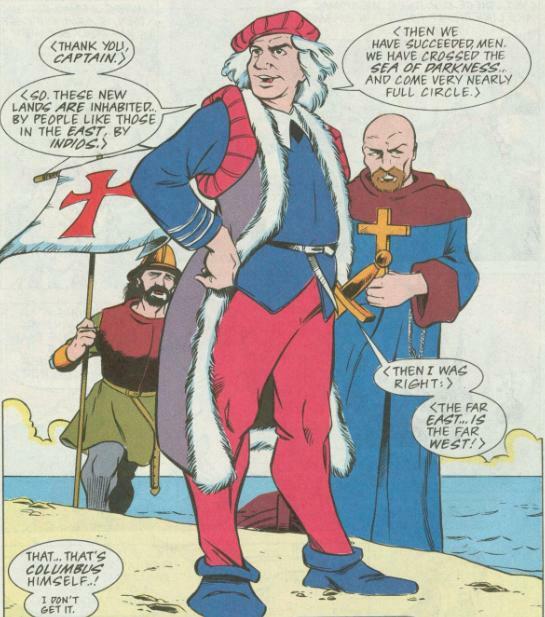 When the Turtles made landfall there precisely 500 years after Columbus, it created a temporal overlap, bringing the Turtles from 1992 to 1492. Don asks the significance of the point where Columbus made landfall and the Other proceeds to explain how his so-called “discovery” of the New World changed the course of human history for the worse. He tells how the White Man brought disease that wiped out most of the indigenous peoples of the New World and how the trade routes Columbus discovered led to the global practice of slave-trading. With Don finally understanding the evil Columbus represents in human history, the Other vanishes as Michelangelo breaks down the door to the brig. Escaping, the Turtles, Splinter and Ninjara leap back into the water just as another storm kicks up. They find themselves washed ashore again the next morning, but this time they are greeted by a passing cruise ship. Stowing away, Don reflects on his recent experiences as the cruise ship pulls into New York Harbor. *This story is continued from TMNT Adventures #39. 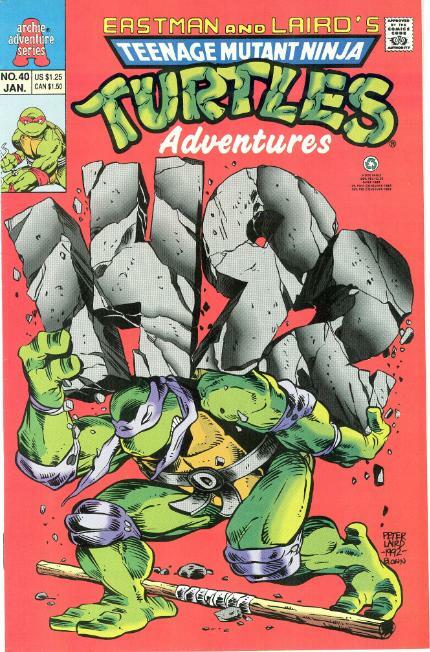 For the Turtles, the story continues into the prologue of TMNT Adventures #41. For the Mutanimals, the story continues in Mighty Mutanimals #7. *The Turtles previously met Christopher Columbus's lesser known older brother Louie in "Louie's Pasture, Part 1". *According to this issue, despite being printed in 1993, the story continues to take place in 1992. *This issue was reprinted in the UK by Fleetway in TMHT Adventures (#76). A better title for this issue might have been “White Guilt”. Sheesh. Still, I do actually like what Murphy (Clarrain) was going for with this issue. The darker side of European and American history is something school classes often gloss over; slavery not-withstanding. Columbus is revered so much in America that we have a holiday that gets us off from school and government jobs for a day and no one seems to take notice of the bewildering idea that a guy is famous for “discovering” an inhabited continent. In reality, though, he wasn’t exactly a stand-up guy and while, sure, laying the small pox epidemic that wrecked the natives of the Americas squarely on his lap is a little unfair, he was still a typical xenophobic, racist product of his century and all that that entails. Some of my high school history courses occasionally delved into the “unspoken truth” about several historical icons, such as how big a douchebag Paul Revere actually was, but most of my grade school classes were more interested in hammering home dates and Jeopardy-style facts than any in-depth look at the true repercussions of celebrated historical milestones. And that’s not even getting into elementary school courses, which pretty much ended our education on Christopher Columbus with that rhyme you will never, ever forget (“In 1492, Columbus sailed the ocean blue!”). 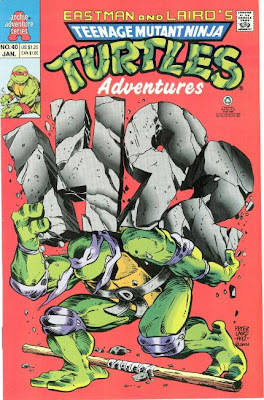 But TMNT Adventures, a young readers book, was aimed at the elementary school set and likely gave them their first sobering look at the truth behind romanticized historical figures. Columbus-himself is drawn extremely menacing and villainous in this story, particularly in the sequence where he lords over the imprisoned Donatello in the brig of his ship, giving a lengthy “might makes right” speech. In stark contrast, look at some of the other children’s media released in 1992 to celebrate the 500th anniversary of Columbus’ landfall in the Americas, such as that abomination of an animated film, “The Magic Voyage”. “1492” was created as a counterpoint to all the media and merchandising of that year glorifying Columbus’s achievement, and though it loses some steam when removed from the atmosphere of that specific pop culture frenzy, it’s still a rather avant garde piece of children’s literature. The drawback, though, comes in the last third of the issue, when the Other appears and gives a 4 page-long rant about how White People ruined everything. I mean, yeah, we totally did, sorry everyone, but the point is that it chucks the subtlety and class of the first 19 pages out the porthole of the ship and just straight up lectures the audience. This is very typical of Murphy, and while Chris Allan’s art does its best to make these moments as visually interesting as possible, it damages the quality of the issue, taking what began as a peek at the unspoken side of history and turning it into a long-winded guilt trip. Barry Grossman and Gary Fields are just completely out of it with this issue, too, as you’ve got dialogue bubbles attached to all the wrong characters and one really lousy moment on page 11 where a single speech bubble has tails going to both Don and Splinter (when it should have been just Splinter). Then there’s all of page 14, where Raph and Mike swap bandanas for several panels, even when Leo is referring to the orange bandana-ed Turtle as “Raph”. On the bright side, Brian Thomas’s inks are superb, especially during the sequence where Columbus speaks to Don in the brig, casting sinister shadows with his oil lamp. “1492” deserves some credit for its intent, though it fumbles it a bit near the end once the Other shows up to explain why all you honkeys out there best check yo-selves. But everything up until that is very well done and shouldn’t be disregarded, even if it is slightly diminished by what comes next. Oh yes, almost time for some Future Shark fun! Oh great, now I'm using my reviews as a platform for social commentary. I'm becoming everything I haaaaaattteeeeee!!!! Just as a note re: the actual date of the issue. While the cover date is January 1993, as you note. It was typical for a long time in comics for the cover date to actually be around 3 months ahead of the actual release, so the left over copies sitting on newsstands for months wouldn't look out of place. As such, it's likely this issue wasn't actually printed in 1993, but was actually released in October 1992, making its theme and setting exactly right in time. To follow up on what oknazevad said: seeing through the ads in the TMNT Adventure comics, it seems like Archie did this consistently: An ad for TMNTA #32 ("May-issue") says it will be on sale February 2, while TMNT Presents April O'Neil #1 ("January-issue") should be "on sale in October".